Frisian Checkers is a Checkers variant that is played primarily in Holland (the Netherlands), and is sometimes called "Dutch Draughts". Frisian Checkers is played on a 10x10 board (like International Checkers), with 20 pieces per side. The board is arranged with a dark corner on the player's left. 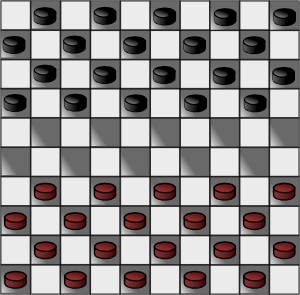 As in most Checkers games, the object is to eliminate all of your opponent's pieces from the board (or block them from moving). Single men may only move forward diagonally. Single men may capture opponents both forwards and back, and in vertical, horizontal, and diagonal directions. Kings may capture opponents both forwards and back, and in vertical, horizontal, and diagonal directions. Note also that Kings are "flying kings" that may move freely along unblocked diagonals. As in International Checkers, maximum captures are compulsory. The same king may only be moved three times in succession without capturing another piece (unless a player only has kings). If, at the end of a game, one player has two kings and the other has one, the player with the two kings must win within seven moves, or the game is a draw. Originally, this strategic board game was created in Friesland, a northern province in the Netherlands. Before the 18th century, Frieslanders developed the strategic board game, now called Frisian Draughts/Checkers. In early days, this popular game was organized into matches by innkeepers in an attempt to entice customers to come into their inn. However, by the 18th century, Frisian Draughts had spread beyond the Netherlands into France and was a notable game in Paris for quite some time. Some sources also mention that this game of checkers was played in other countries such as Armenia and Thailand. In the 1930's, the Frisian Draughts Association (DFS ~ Dambond Fries Spel) was founded and became the organization that coordinated Frisian draughts matches. Why should you play Frisian Checkers? The Frisian Draughts Association says "Because of the characteristic striking possibilities (diagonally, horizontally, vertically), the opponent is always closer to you on the board than one tends to think. Beautiful combinations easily occur. The chance of drawing is small."